PyAbstantia is a Python-based program for bond-valence sum (BVS) mapping and bond-valence energy landscape (BVEL). The author is Shin-ichi NISHIMURA. For details of BVEL, read the review and papers by Prof. Stefan Adams. Aug. 4, 2017: Version 0.7c. The multiprocessing support was improved. Jul. 21, 2017: Version 0.7b. build_lib.sh was modified for compiling with ifort on macOS. Jul. 21, 2017: Version 0.7a. The gfortran compiler options in build_lib.sh were fixed. Jul. 15, 2017: Version 0.7. This is the first public release of PyAbstantia. PyAbstantia is mainly written in Python. The latest version (0.7) has been tested on Python 3.6.x and Python 2.7.x. The NumPy modules are required. Core parts of the map calculation are written in Fortran. If you need more speed, you can use Intel Fortran Compiler (ifort) for compiling the core modules written in Fortran. This execution outputs a binary file sample.pgrid for visualizing with VESTA. -mp [NP] Enable multiprocessing. [NP] is a number of processes. PyAbstantia requires a input file storing the atomic coordinates information and the parameters relating to BVS. The input file is written in ASCII format. Lines starting with # are treated as comments. Arbitral numbers of blank lines are allowed. PyAbstantia does not use any symmetry operations. You have to supply all of the atomic coordinates in the unit cell. Use CIF mode for automatic generation of the input file. RIETAN-FP and its associated environment may help to generate the input file and to run the map calculation. After running PyAbstantia, open the output file alpha-AgI.pgrid by VESTA. Set the isosurface level to 0.4. 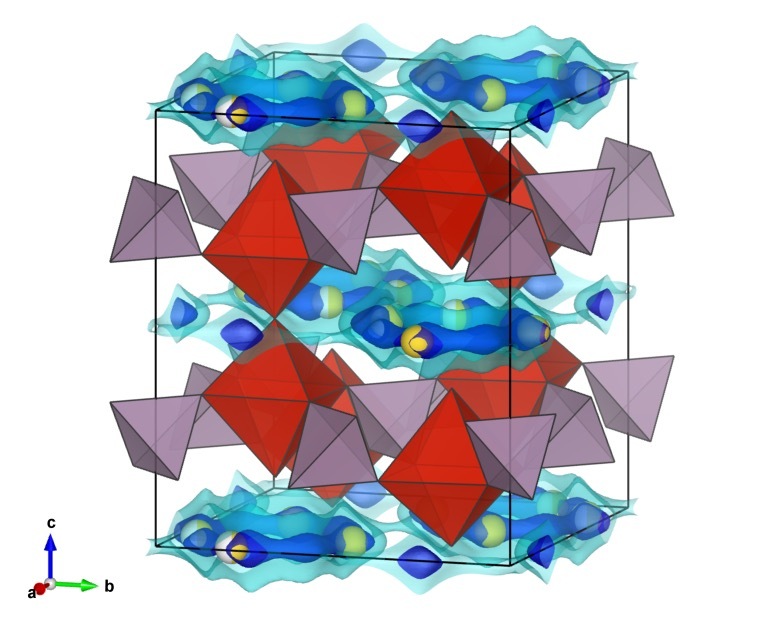 You can visualize the BVS isosurface with the crystal structure by importing the *.pgrid file to the crystal structural data. 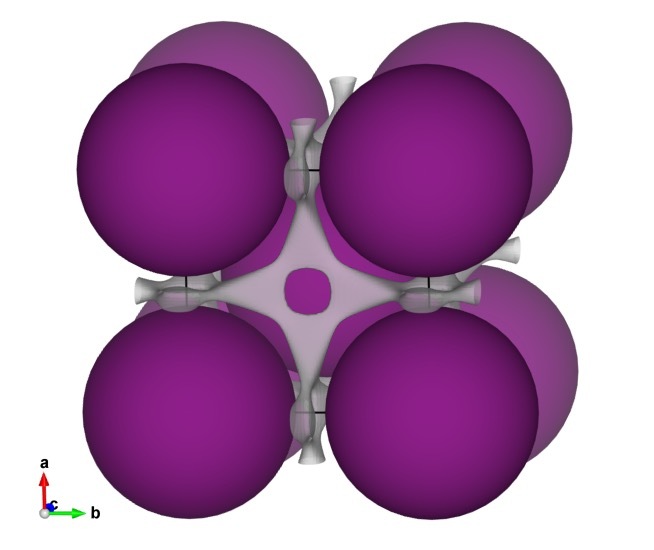 The purple spheres are the iodide ions. 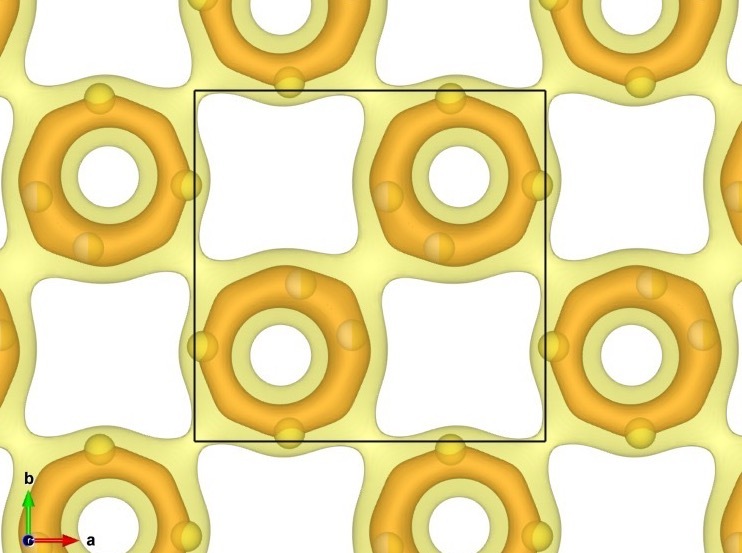 The isosurface is drawn at a BVS mismatch level of 0.2 for the silver ion Ag+. For BVEL mode, a keyword BVEL should be given at the end of title. This keyword activates an internal flag for BVEL. PyAbstantia can read the Crystallographic Information File (CIF) as input data of crystal structure. This mode helps users to generate the standard input files via step by step prompts. This mode requires a CIF parser in pymatgen. Install pymatgen to use CIFs as inputs. Following options are available only in the CIF mode. -a Set the “softness-sensitive” parameters for the bond-valence calculation automatically. -r [STEP] Set resolution automatically with resolution [STEP] in Å. If [step] is not given, a default value 0.1 is used. -e Generate the input file for BVEL mode. Since the calculation conditions are case dependent, fully automatic generation of the input file is not a realistic way. Some parameters can be set to unreasonable values in the automatic generations. All the users have to check and edit the generated input files carefully before running the map calculation. PyAbstantia does not handle the formal charges in CIF. Users must specify the formal charges explicitly in the input file. In this tutorial, we will use a CIF as an input. So you need to install pymatgen to use the CIF parser. 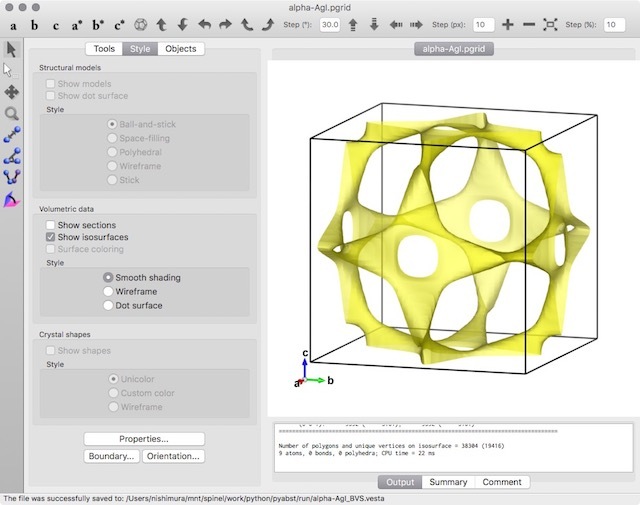 Download a CIF file from Crystallographic Open Database (COD). Input a formal valence number of target ion. Input a number of species for counter ion. No. of processes was reduced to 7. No. of processes was reduced to 6. Then you will get following three files. Open the 5121543.inp with your text editor and check the parameters. If you edit the input file, you need to rerun PyAbstantia. After running PyAbstantia, open the CIF by VESTA and import 1521543.pgrid. Set the isosurface value to 0.2, and disable the sections. Then you will get 1521543_BVEL.pgrid storing the BVEL map. 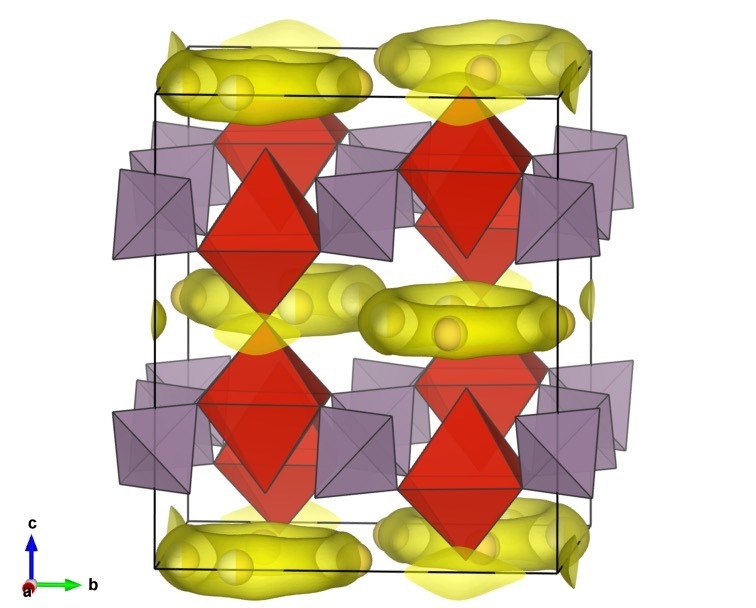 The isosurfaces in the below image were drawn at levels of -2.9 and 1.4 eV (0.5 and 2.0 eV above the lowest energy, respectively). © Copyright 2017, Shin-ichi NISHIMURA.